The episode we've all been waiting for returns tonight, How I Met Your Mother Fans! Robin Sparkles returns and with her, a host of other (actual) Canadian born celebrities. The clip we have to show you gives away some of the gloriousness of Robin's pop star alter-ego's back-story, including where things went wrong for her. 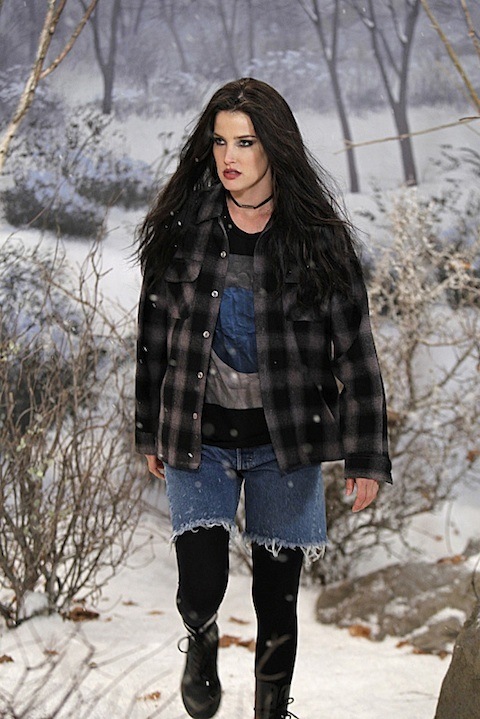 We also have a spoiler photo that shows Robin Sparkles looking a bit less sparkly. We shared some photos from this week's HIMYM episode ("P.S. I Love You") already. And now we see how Robin Sparkles and many of the announced celebrities fit into the episode. It's not a pretty picture, but you won't be able to look away! If you don't want to wait for the episode to air tonight, watch the clip below. Did angry Robin go alternative? And if so, please - please - tell me this stage of her career includes some kind of alt-rock recording. Perhaps the above photo is a snippet from a new music video? We can hope! 90s! How I Met Your Mother airs Monday at 8:00 p.m. ET on CBS.